With the conditioned box drying installation the seed in the boxes can be dried to the desired moisture content. This can be freshly harvested seed, or seed that needs to be brought to a lower moisture content before shipping. 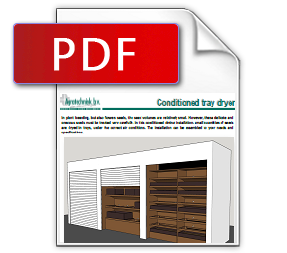 With this conditioned drying installation, a small number of boxes can be dried individually. The installation can be manufactured according to your wishes and according to your specifications. The conditioned box dryer is a closed installation with which the seed is dried to the desired moisture content at the desired air condition. This by using dried and cooled air. The boxes are placed separatedly from each other in an air distribution system. Which ensures that the air is sucked through the seed. The air distribution system is located in a closed casing so that the seed can be dried regardless of the outside conditions. 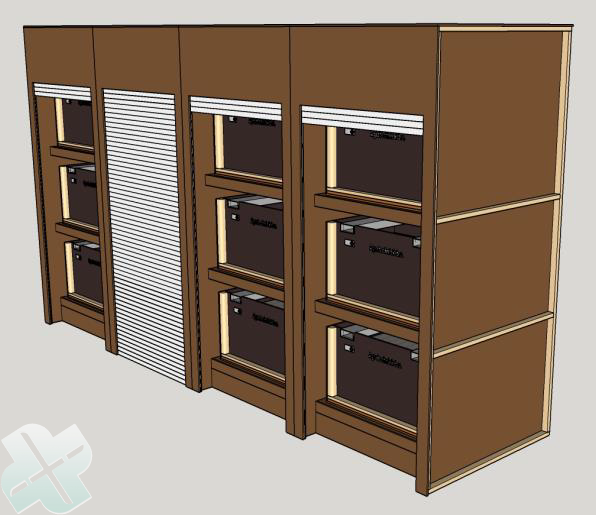 The box dryer is adapted to the size and design of the drying boxes. The box dryer is assembled according to your wishes; the number of sections and the number of boxes per section. Dried air is added per section. This air is cooled or heated to the desired temperature. The equipment installed for this purpose is selected on the basis of the amount of seed, the moisture content and the desired drying speed. At the top, the air is brought to the desired moisture content and temperature. This ensures that the seed is always dried at the desired air conditions. 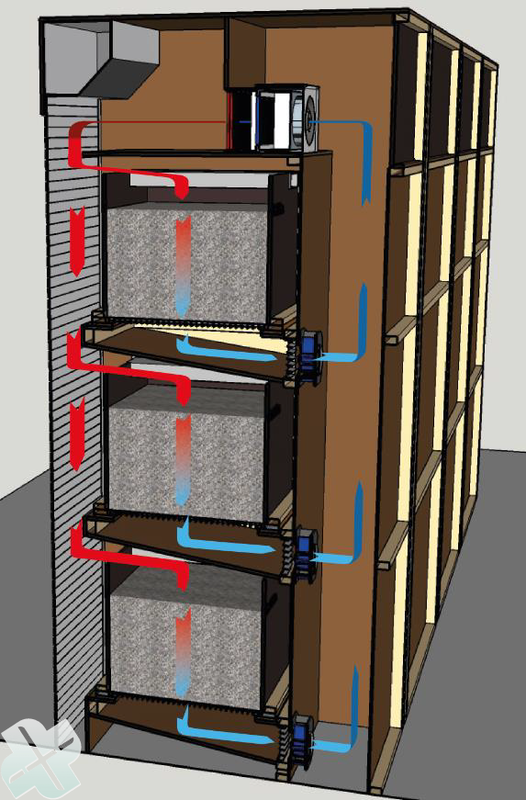 The design of the air treatment installation depends on the required air circulation, the amount of moisture that must be removed and the temperature at which the drying needs to take place. A high-pressure fan has been installed for each box. The air volume can thus be configured per box to match the quantity and type of the seed. With the conditioned box dryer the air is sucked through the seed from the top to the bottom. The air is blown upwards at the rear and sucked in through the top at the front. 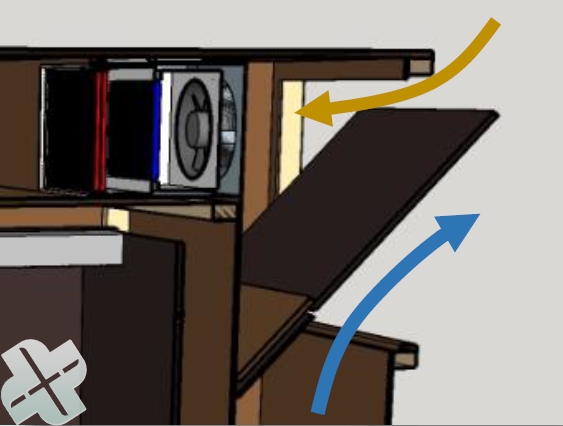 The picture above shows an option to remove humid air to the outside and to draw in drier (outside) air. In the case of moist seed, the drying time is thus greatly reduced. When the air from the seed becomes drier than the outside air, this air will automatically be used in the drying process.